Mahidol University has its origins in the establishment of Siriraj Hospital in 1888 by His Majesty King Chulalongkorn (Rama V), and the hospital’s medical school is the oldest institution of higher learning in Thailand, granting its first medical degree in 1893. Later becoming the University of Medical Sciences in 1943, Mahidol University was renamed with great honor in 1969 by H.M. King Bhumibol Adulyadej , after his Royal Father, H.R.H Prince Mahidol of Songkla , who is widely known as the ‘Father of Modern Medicine and Public Health in Thailand‘. Mahidol University has since developed into one of the most prestigious universities in Thailand, internationally known and recognized for the high caliber of research and teaching by its faculty, and its outstanding achievements in teaching, research, international academic collaboration and professional services. This diversified institution now offers top quality programs in numerous social and cultural disciplines, including the most doctoral programs of any institution in Thailand, yet has maintained its traditional excellence in medicine and the sciences. The overall philosophy of Mahidol University is best captured by the university motto: Attānaṁ upamaṁ kare อตฺตานํ อุปมํ กเร In the Pali language, this translates as the Golden Rule in English: ‘Do unto others as you would have others do unto you’. This underlying theme pervades every aspect of Mahidol University as it endeavors to imbue graduates with the conviction that, aside from achieving academic excellence, they have a solemn duty to improve the quality of life for all humanity. The university’s namesake, H.R.H. 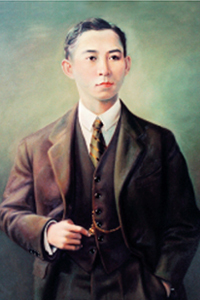 Prince Mahidol, has eloquently stated Mahidol University’s universal view of higher education: ‘True success is not in the learning, but in its application to the benefit of mankind’. With the Royal Philosophy as a guiding light, Mahidol University continues to take progressive action to internationalize and diversify itself, so that its graduates will be globally informed as well as socially aware. In this globalized and interconnected world, Mahidol University recognizes that achieving academic and moral excellence requires maintaining strong relationships with the world community, and offering lifelong and equitable quality education for all. Mahidol University is determined to be a world class university. To excel in health, sciences, arts, and innovation with integrity for the betterment of Thai society and the benefit of mankind. On 16 October 2007, the Thailand National legislative Assembly approved Mahidol University as an autonomous institution. This transformation will enhance the university’s efficiency, flexibility, and ability to innovate, and standardize its practices with those of other world-class universities. Recognizing the challenges facing humanity in the new millennium and the fundamental responsibility of higher education institutions to assist in meeting those challenges, Mahidol University follows a policy of constant expansion in the breadth and depth of its facilities and academic endeavors. By remaining globally aware and staying abreast of new academic discoveries and technologies worldwide, Mahidol University continues not only to meet the needs of Thailand for education, training and research, but through internationalization, the needs of the global community as well.